A quick, healthy breakfast in the mornings couldn’t be simpler for an on-the-go college student with these sweet and savory options and endless variations. Known as the most important meal of the day, breakfast is often skipped by college students, as it is deemed too time-consuming of a task to undertake. However, breakfast does not have to be given such a bad reputation. Instead of opting for a sugary box of cereal or pricy breakfast tacos, quick, precautionary measures can be taken to ensure a fun and much healthier alternative to many overtly sugary, fatty breakfast options. Three simplistic breakfast ideas include a chilled, refrigerated oatmeal pudding made overnight with practically no effort, a yogurt parfait with with a sea of flavor combinations and a savory, quick-to-throw-together avocado toast in the morning. As opposed to it’s piping hot, sticky and slimy cousin, overnight oatmeal is a much more posh variation — cool in temperature, with a pudding-like mouthfeel and taste. The raw, rolled oatmeal absorbs the liquid used, giving a much more preferable texture than that found in hot oatmeal. The methodology behind it could not be simpler: mix equal parts regular, rolled oatmeal and a liquid — say water, any type of milk or broth — if going for a savory variation. For a base recipe, try using ½ cup of both oatmeal and the preferred liquid, adjusting amounts as needed in the future. As oatmeal is relatively bland by nature, it absorbs different flavors quite well, whether they are sweet or savory. Think of it as a blank canvas for your many mix-ins and toppings. I like to mix the oatmeal, almond milk and preserves before putting the mixture into the refrigerator for a chill overnight. It takes two minutes, tops. I’ve done it before right before heading to bed on nights when I’m delusional from having studied, and I promise, the 120 seconds of effort put in are so worth it in the morning. When I’m ready for breakfast, I’ll top the mixture with sliced fruit, a drizzle of honey and a sprinkling of chocolate chips and/or nuts, and it’s good to go. For a more savory variation, I’ll heat up the oatmeal prepared with a stock of some sorts in the microwave for a minute, and top it with a crispy-edged fried egg, a drizzle of soy sauce, sprinkling of both black sesame seeds and coarse salt, and dig into a salty Asian-inspired take on overnight oatmeal. On mornings where I haven’t prepared overnight oatmeal the night before or if I am in a particular rush, I’ll make a simple yogurt parfait. Yogurt, like oatmeal, serves as a creamy, white base to a variety of mix-ins and toppings. Put spoonfuls in a bowl, sprinkle and drizzle with fruits and toppings, and you’re good to go. Personally, I prefer Greek yogurt for it’s thick consistency and creamy tang, but any type of yogurt, dairy or not, will do just fine. This may be one of my favorite go-to breakfasts on the days when I have a bit more time, say 10 minutes to make a filling breakfast. Atop a hearty, rustic bread and nestled within a bed of a flavorsome spread such as cream cheese or pesto, or wilted greens, avocados are packed with healthy fats, protein and complex carbohydrates. Avocado toast can be savory or sweet, but I much-prefer savory variations of this filling breakfast. 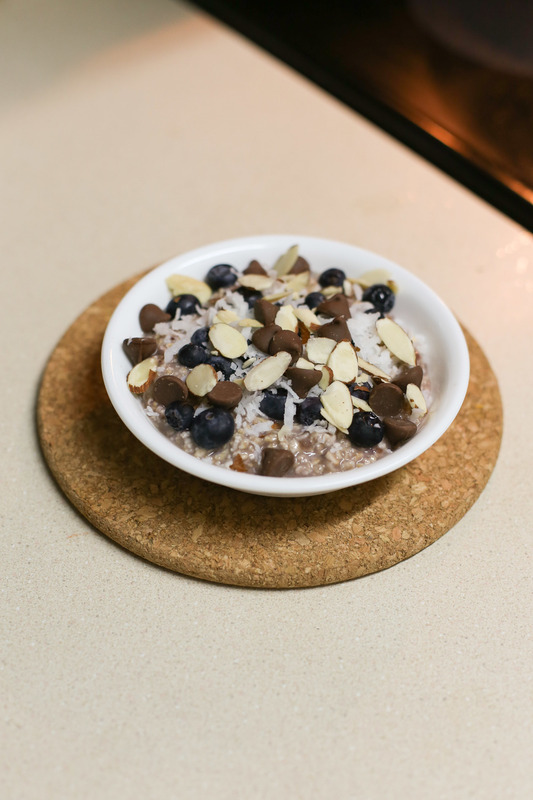 With a whole host of varieties and types, simple and healthy breakfasts can take five to 10 minutes to put together, with immensely satisfying results. Your stomach, growling and empty in the morning, will thank you — as will your taste buds, for taking them on a delicious journey into breakfast salvation.